With Mahmoud Abbas one week threatening to quit and hand Netanyahu the keys and the next week announcing that the Palestinian Authority (PA) will be issuing Palestine Passports in six months, what is Israel to expect and react without appearing ridiculous? Perhaps that is the entire objective of Abbas’s schizophrenic actions. Then there is the situation with the European Union with their two pronged assault on Israel, one economic and the other territorial. The economic assault has been prevalent in the news with their vote demanding separate labeling of all products coming from east of the Green Line. This will next morph into a demand that any product with X percent, eventually becoming any amount even having a single item from east of the Green Line. The inevitable end result will be a complete embargo of all Israeli goods as a precaution of any part having come from the ‘Zone Which Must be Free of all Jews’ as the Great and Powerful European Union has so decreed. The territorial assault has even been ruled illegal by courts but when you are ‘The Great and Powerful European Union’ such trivialities hold no power over their edicts of what must be as they said so. This territorial assault has been the European Union’s building of Arabs from within the PA areas homes and other structures and land from within Area C which the Oslo Accords reserved to be completely under Israeli control. The Oslo Accords stipulated three zones which the parties agreed to their stipulations. Area A was given to complete PA control, both security and administrative; Area B was given to joint security jurisdiction with PA having administrative control and Area C under complete security and administrative control. 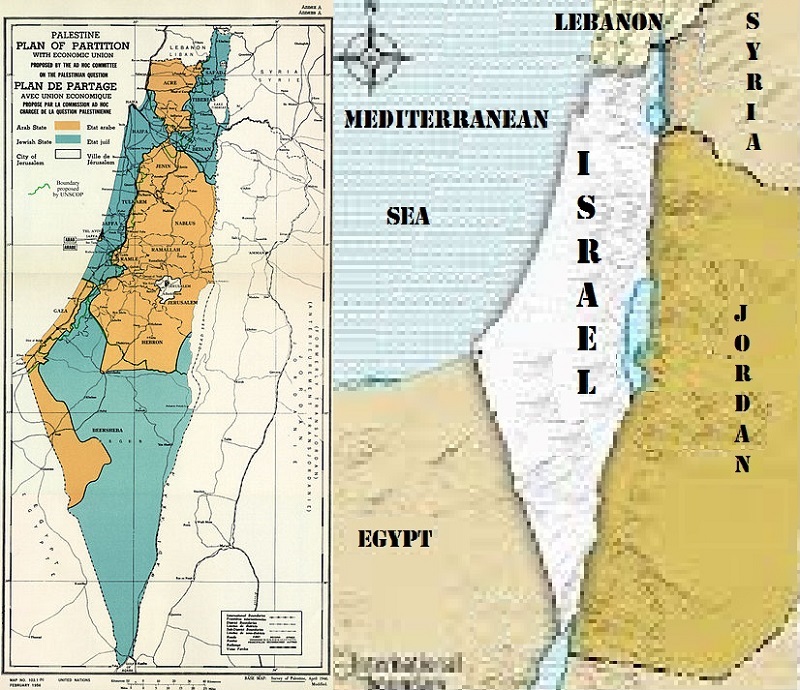 The intent of the Oslo Accords was for Area A to result as an Arab state, Area C was to be annexed into Israel upon settlement and Area B was to be negotiated between the two parties, the PA and Israel. The whole idea of the Green Line which was actually the armistice line drawn when the combined seven Arab nations’ armies were unsuccessful in their efforts to completely eradicate the nascent Jewish State during the hostilities during 1948 and 1949. 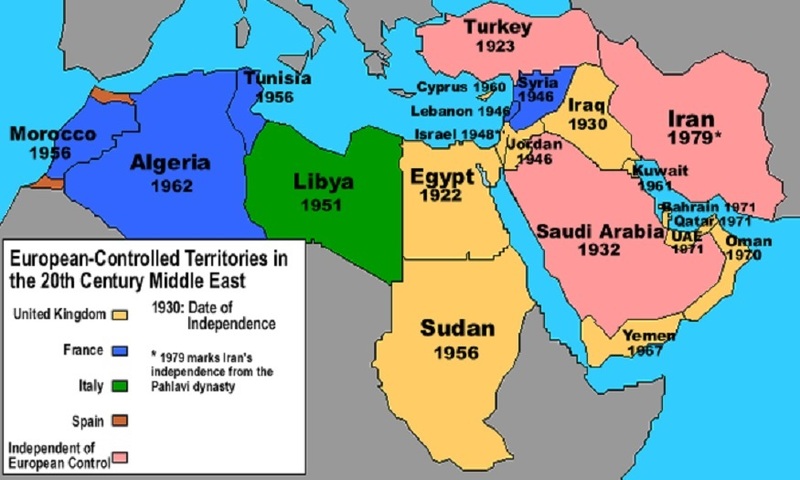 During this war which Israel euphemistically calls its War of Independence, the war was initiated by the aforementioned Arab armies which were perched on the Israeli borders, the current borders with Lebanon and Egypt, all of the Gaza Strip, and along the eastern shores of the Jordan River as these were the determined borders from the British Mandate and reconfirmed by the United Nations. 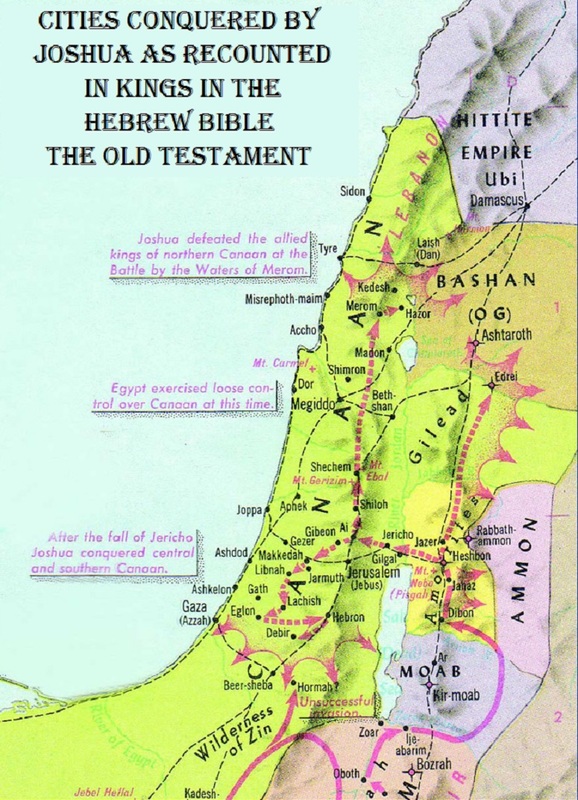 The so-called occupied territories or disputed territories were according to all treaties including those signed by the Arab League by King Farouk recognizing the Jordan River as the legal and internationally recognized eastern border of Israel. So that raises the question of exactly who is occupying whose lands? Should there be any moves by the PA to declare a state in any parts of Judea and Samaria, the actual given name throughout history of the so-called West Bank, other than in Area A, and especially and expressly in Area C, that would be tantamount to a declaration of war as that would entail taking lands which are considered to still be contested. 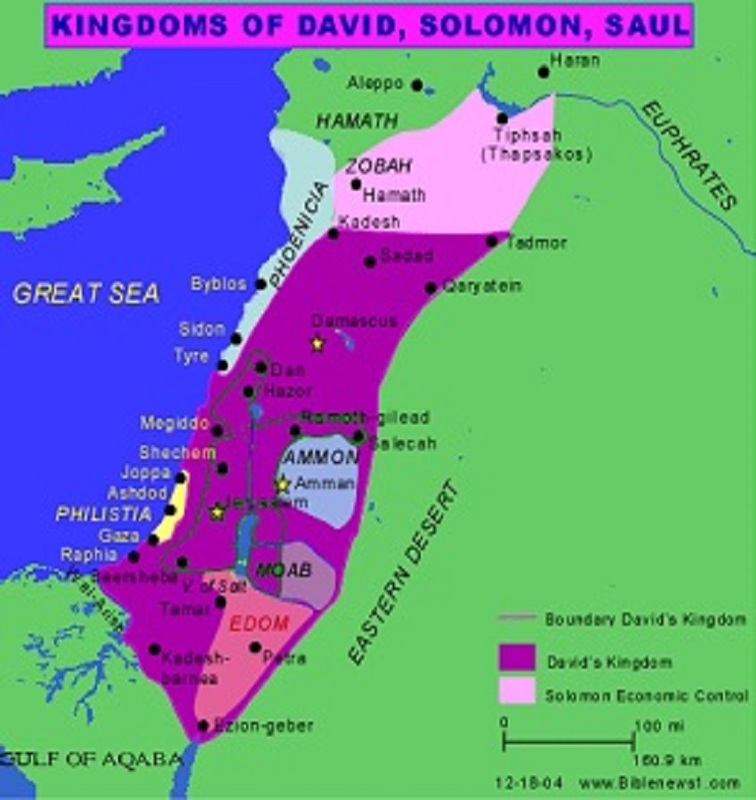 This was what their rioting and forced occupying of almost all of Hevron as well as every desecration of Jewish holy sites and structures such as the ancient synagogues which they claim will destroy the al-Aksa Mosque despite there being miles from the Temple Mount and some not even located within Jerusalem. These accusations of Israeli or Jewish attempts or even intentions to destroy Islamic holy sites is one of the best and most egregious examples of projection as this has been their modus operandi exampled by their numerous desecrations of Kever Yoseph (Joseph’s Tomb) and destructive excavations on the Temple Mount destroying antiquities from the last three thousand plus years of Jewish artifacts. This has been proven beyond any shadow of a doubt by the finds made in Operation Sifting which is an attempt to salvage even the smallest of antiquities out of the rubble piles where the crushed remains dug from beneath the Temple Mount by PA excavations. Then there are the constant terror attacks which are either not given any coverage by the world’s media or is given such a slanted and misleading coverage as to be beyond credulity. An example comes from a stabbing attack near the Old City’s Yafo Gate from yesterday where the Arab attackers murdered one Israeli, severely injured a second Israeli and one Israeli was accidently shot and killed when Border Police officers were attempting to end the attack in which one of the attackers was killed and the other injured and taken into custody. The coverage was so slanted that Israeli officials have felt it necessary to register complaints over the network slanting of the news. 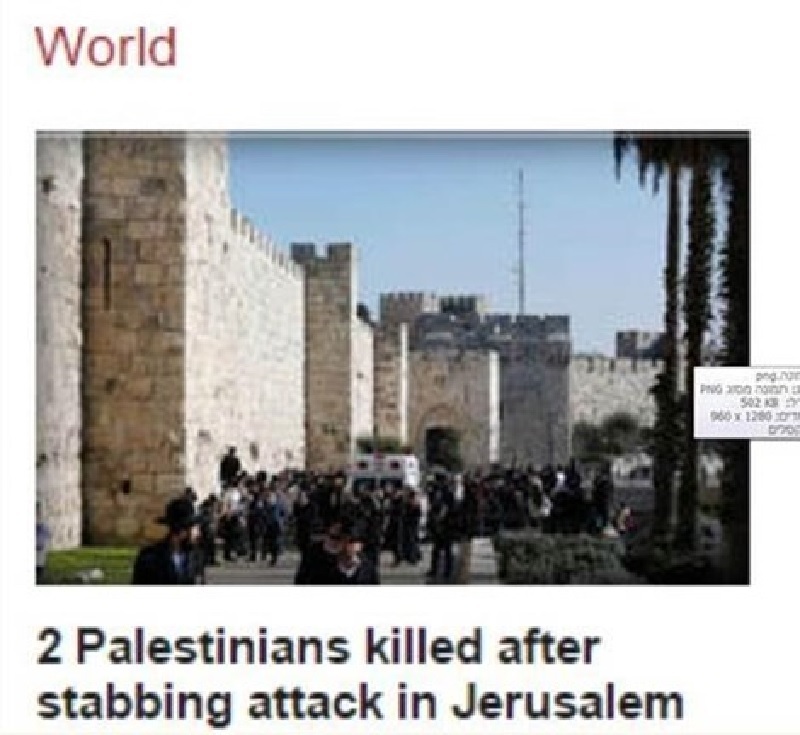 CNN reported the attack reporting there were four dead without differentiating between attackers and victims with a banner stating “four dead in violent stabbing at Jaffa Gate” but CBS was not to be outdone in this false implications when their screen titles with two strangely amorphous or simply misleading as with the initial title. 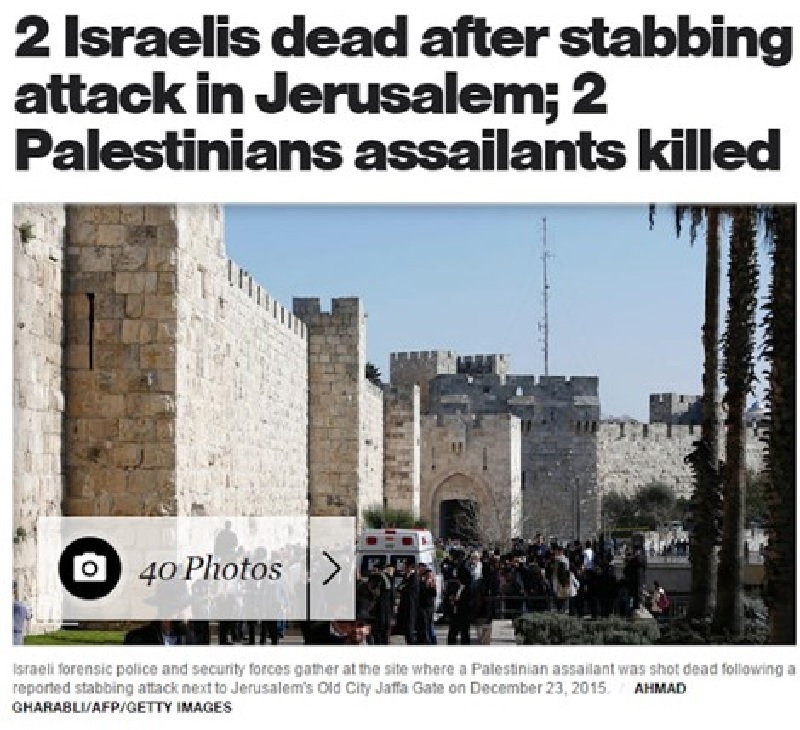 CBS began coverage with the title “2 Palestinians killed after stabbing attack in Jerusalem” and later changed to read “2 Israelis dead after stabbing attack in Jerusalem; 2 Palestinian Assailants Killed” which was slightly less ambiguous or misleading but there is no excusing the initial reporting title. These are far from the first of the litany of misleading titles and reports with one of the more famous the Jerusalem reporter on a split screen reporting that the Arab ‘Palestinian’ shot dead was running unarmed and definitely did not have a knife which he reported repeatedly even after being told that the video was in the split screen and it showed the Arab charging baring a knife over his head in his raised hand and still the on the scene reporter refused to change his slanted reporting. This was so telling of who and how reports from Israel and especially reports from areas where terrorism is a definite threat and the average Western, especially European, reporters feed their feelings of trepidation hiring local reporters willing to report from these ‘dangerous’ locations which more often than not are Arabs and too often they have a slanted view which taints their reports. This sits just fine as the reporters themselves find such reporting believable and in tune with their line of reporting, thus much of Europe and the world, especially those relying on the BBC, AFP, CNN, ABC, NBC, CBS and even at times and becoming more prevalent with FOX, are receiving slanted news on which they then base their feeling on the conflicts in Israel. They are all guilty of slanted reporting which is far more often than not against Israel and supporting the ‘under dogs’ Arabs despite their being supported by the entirety of the Arab world, much of the Muslim world, and by many from Europe and other Western nations and solidly by the European Union. Even the leftist media in Israel is just as guilty as any in the international arena. Since the Duma arson attack and the following detention and rumored mistreatment of even some minors in efforts to force confessions and fortunately there will be a trial which will hopefully bring into public review exactly what techniques were used to gain any confessions or not get a confession from many who still might be called to attest to the methods used. If the rumors which have circulated turn out to be true, then waterboarding would have been hazing compared to the techniques used here which came closer to the methods of Tomás de Torquemada. Where we would prefer to keep my faith and belief that the state is honorable and would not act in any way dishonorably which is something the recent reviews by a select board of former and active commanders and select officers who are responsible for similar review of troops in combat who reviewed the past war in Gaza which presented a report which lauded the IDF actions and gave special note to the review internal to the IDF and their review procedures in cases of accusations or internal reporting of misuse of power or other abuses. We will need to wait and see what develops but an open and transparent review would go a long way to belay our doubts and fears. There is one thing that we feel great embarrassment and sorrow when we hear about acts of violence by fellow Jews against other Jews especially as well as when such violence is directed at Arabs who are innocent of any aggressions against Jews as such actions work against any possibility of settling our differences peaceably. If it proves out that Jews were behind the Duma arson attack which murdered an entire family, we support the prosecution to the highest charges and highest sentencing upon a conviction for each offender. Equally important, if it proves that no Jews were found to be guilty and that evidence points elsewhere that Israel not permit the PA to whitewash an investigation and do whatever is within their abilities to find and bring the actual perpetrators to justice just as they would prosecute any Jew responsible for such a horrendous crime. Any crime of such viciousness must be researched and investigated to the utmost depth and chase down every potential lead until every last detail is known and all involved are persecuted. There is no reason for murdering an infant and an entire family no matter what the reasons and those involved must be brought to justice. The same needs to go for these terrorists who have been attacking Israelis need to be brought to justice and made to serve their entire term ending these releases just to have Abbas and friends kick us in the face for yielding to his demands. We, meaning all of Israel are fed up with the world always demanding Israel make concessions until we have no concessions left, period. How about instead of asking Abbas for some promise he never plans to keep or honor, we simply demand that he state explicitly exactly what terms would he be willing to accept for an end to all hostilities and borders such solution would demand to satisfy all the Arab demands. Perhaps having Abbas advertise exactly what terms would be acceptable to him would finally present the real reason there has been no peace and there can never be peace as long as Abbas or any of his minions are involved with the peace process as they refuse the process and demand all or nothing. It is time they were told either they compromise or they will receive nothing and be removed from power along with all the rest of the people behind thus intransigence allowing calmer and more reasoned and rational minds to come to the fore who can reach a compromise. If they also prove unable to make peace, they too can face the same answer as above and continue the willowing until somebody is found willing to reach a fair peace. The only solution to the Arab Israeli situation will require honesty from the Arabs, their speaking honestly, and finally the settlement of the Arab Israeli conflict which will require a desire from the Arabs and reasonable demands from the Arabs otherwise Israel will be left with little choice but to reclaim all the presumably contested lands which were recognized at the time of her birth with her eastern border being the Jordan River and not the Armistice lines reached with the Arab world after the six plus national armed forces stood ready to do battle the morning of her independence where Israel managed to survive losing much of Judea and all of Samaria to Jordan who occupied these lands from May 1948 through June 1967 when Israel regained these lost lands and has been attempting to manage a peace treaty with the Arabs who remain intransigent, refusing to compromise on their maximalist demands. 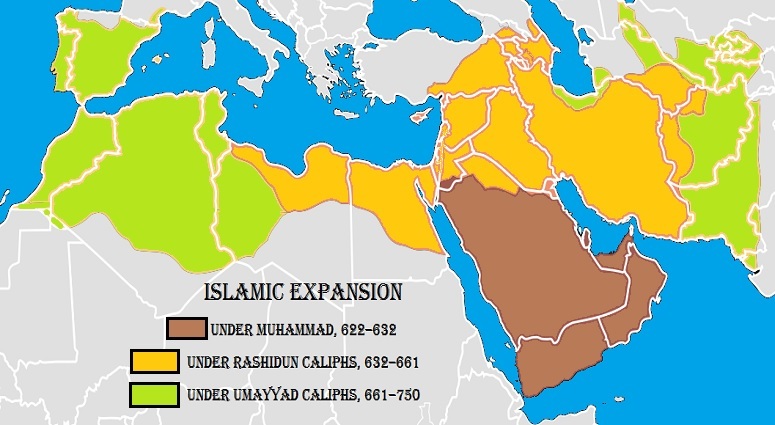 Until the Arabs compromise, they should be made to lose land and eventually their continuing to refuse to compromise from their demand to replace Israel choosing to fund a terrorist state over a normative functioning state, then they will destroy any hope of there having a functioning state, there will only be the functioning state of Israel.